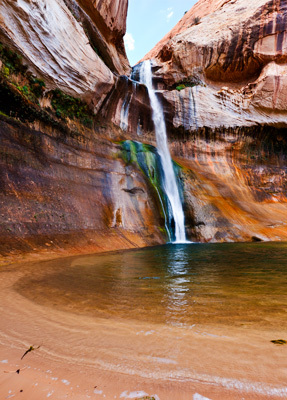 Calf Creek Falls is part of the Grand Escalante Staircase National Monument. 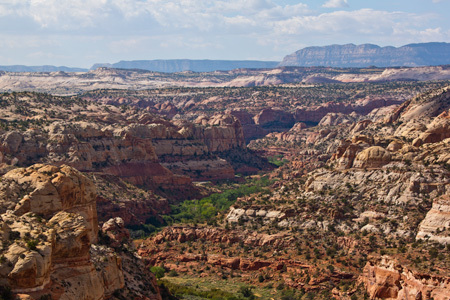 The Grand Escalante National Monument is huge, rugged, and mostly road less. It is said to be the last area of the US that was mapped. It is beautiful country. We only had time to visit the Calf Creek Falls Recreational Area. Next time we visit here we'll budget several days to explore more of the National Monument. View of Calf Creek from road into Calf Creek Recreational Area. Calf Creek is the green strip. You can see the trail on the far side of the creek. Calf Creek is a small, clear year round stream that flows through the Calf Creek Recreational Area. It gets its name from the early settlers that used the box canyon formed by the creek to pen calfs when it was time to wean them. The creek is very clear and is the home to brown trout According to Fly Fishing, fishing for the brown trout here is good sport. We didn't have fishing gear nor the time to find out if this is true. 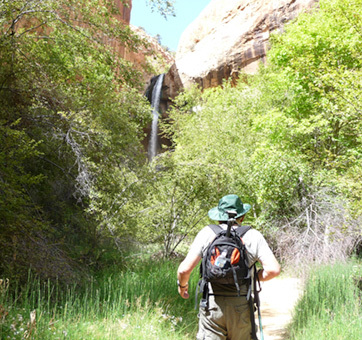 The trail from the parking lot to Calf Creek Falls is about 2.8 miles one way. 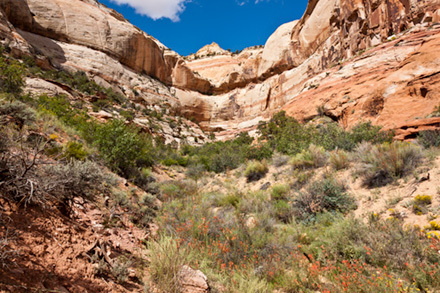 It is an level hike that mostly follows Calf Creek. 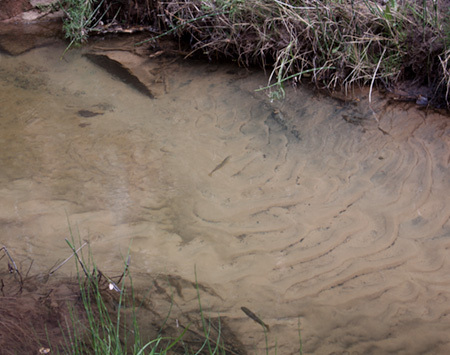 There are short box canyons leading away from the creek. A few wild flowers were in bloom when we were there in early September. 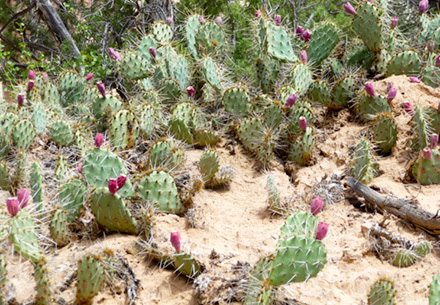 There was even a large area of cactus. 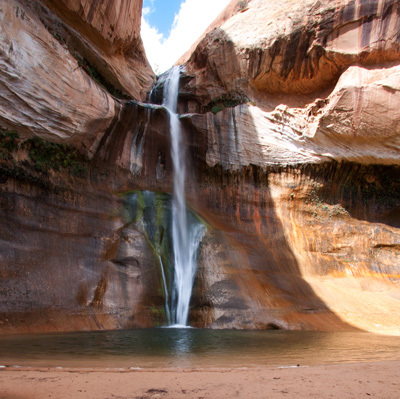 Calf Creek Falls is a wonderful sight in the middle of the desert. 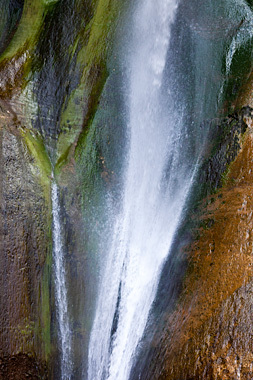 The water falls through a narrow break in the cliff, plunges about 180 feet down into a large quite pool. The algae growing on the cliff walls is several different shades of green and provides a wonderful contrast with the reddish cliff walls. The whole area is a semi-circular basin. The shade and the cool mist from the falls provide a welcome change from the bright sun on the trail. Travels with Nessie Home :: Site Map:: Contact webmaster@ncsparks.com-email us:: Copyright Leslie Sparks 2006, 2007, 2008, 2009, 2010, 2011, 2012,2013,2019:: Last modified: August 29 2013.